Within the South Coast Air Quality Management District (SCAQMD), most stationary engines need to meet the requirements of Rule 1110.2, which applies to stationary and portable engines that have more than 50 horsepower (HP) and are fired on gaseous or liquid fuels. The rule doesn’t apply to emergency engines with a permit condition that limits their operation to 200 hours per year. 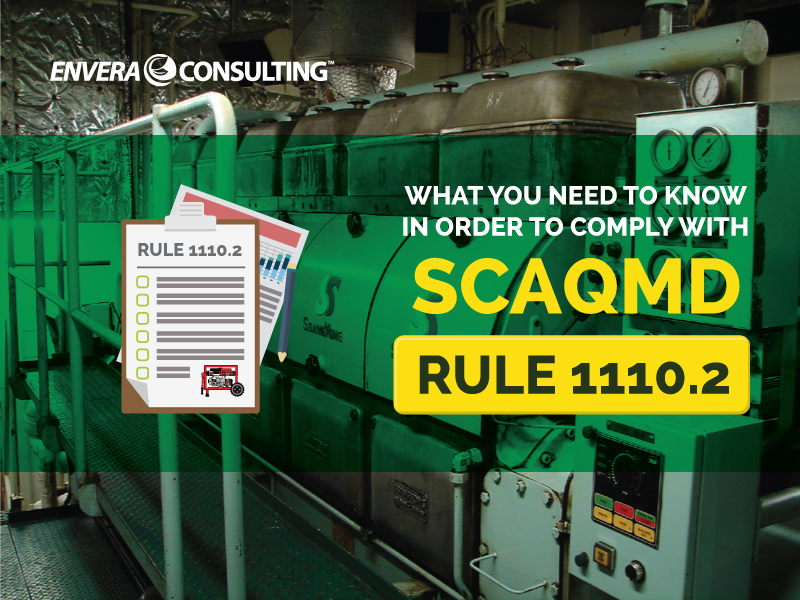 While Rule 1110.2 was first adopted in 1990, it was significantly amended in 2008, primarily to increase the amount of monitoring, reporting, and recordkeeping (MRR) required from facilities with engines subject to the rule. These additional requirements, which were needed because the SCAQMD frequently found that a large percentage of engines were not in compliance, greatly increased the amount of effort needed in order to comply with Rule 1110.2, mostly due to the need to implement a robust inspection and monitoring program. There are emission limits for new non-emergency electrical generators, and for these, we’ll refer you to the rule for more details. It’s important to note that the emission limits according to Rule 1110.2 don’t apply to engines that operate less than 500 hours per year and consume less than 1,000,000,000 BTU of fuel per year. Rule 1110.2 requires that engines be equipped with air-to-fuel ratio controls (AFRC), including an oxygen sensor and feedback control. The rule also requires that the make and model of an engine’s AFRC be listed on the face of the permit. We’ve found that most engines have an AFRC installed, but the unit isn’t listed on the face of the engine’s permit. In such a case, a permit modification is necessary to add the AFRC to the permit. One of the overarching goals of Rule 1110.2 is to ensure that engine operators are properly operating and maintaining their engines, which is done by requiring the development and implementation of an I&M program for each engine on site (although engines at a facility can be grouped into a single plan), which includes emission testing. Rule 1110.2 lists all of the requirements of an I&M plan. Note that a facility that’s required by Rule 1110.2 to have a NOx and carbon monoxide CEMS (continuous emission monitoring system), or voluntarily elects to install a NOx and CO CEMS that complies with this rule, doesn’t need to have an I&M plan. One of the most demanding requirements of Rule 1110.2 is the emission check with a portable analyzer emission check, required once a week or every 150 operating hours. Similar to what’s found in Rules 1146 and 1146.1, the testing frequency can be extended to once a month or once every 750 operating hours if the engine passes three consecutive emission checks without any adjustments to the oxygen set points. This extension applies until the engine fails an emissions test or, for rich burn engines, until the oxygen sensor is replaced. Portable analyzer testing must be performed by a technician who has received a certification from the SCAQMD for conducting these emissions tests. More information on becoming certified to conduct portable analyzer testing can be found on the SCAQMD’s website. Records of all portable analyzer testing must be kept for at least two years; that time period is upped to five years if the facility is subject to Title V.
Similar to what you’ll see in the source testing requirement of Rule 1110.2 (discussed in the “source testing” section below), a portable analyzer test cannot occur within 72 hours of an engine or control system maintenance or tuning unless it’s an unscheduled and required repair. We’ve also seen more elaborate operating logs that track the schedule and results of portable analyzer testing and other operational data. Many of the requirements for Rule 1110.2 are based on a time meter, which is why the rule requires the installation and maintenance of a non-resettable totalizing time meter. Another requirement of Rule 1110.2 is that source testing each engine must take place at least every two years or every 8760 operating hours, whichever occurs first. If the engine hasn’t operated more than 2,000 hours since the last source test, the testing frequency can be extended to once every three years. It’s important to note that a Rule 1110.2 source test must be conducted at least 40 operating hours or one week, whichever occurs first, after any engine servicing or tuning. Facilities must submit a source test protocol at least 60 days before the scheduled date of the source test for approval by the SCAQMD. After the source test protocol is approved, the facility must notify the SCAQMD of the source test date so that the agency may observe the test. Once the source test has been completed, the facility must submit the report to the SCAQMD within 60 days. Under Rule 1110.2, quarterly reports must be submitted no later than 15 days after the end of each calendar quarter. It’s important to note that a Rule 1110.2 quarterly report must be submitted even if no incidents have occurred during the reporting period. Forms for the report can be found on the SCAQMD website.